It is the perfect amalgamation of the east and the west in this new design of Bansuri with bamboo lip-plate. It combines the organic function and sound of traditional bamboo Bansuri with superior acoustics of the western concert flutes head joint design. Bansuri bamboo flute has been around for thousands of years in India. Despite passage of eons, the design of Bansuri has remained virtually unchanged. The most major innovation in its design happened in the middle part of the 20th century by Pandit Pannalal Ghosh. He lifted Bansuri out of the category of a high pitched folk instruments and established it into the category of serious Indian classical instruments. This new design basically involved using much bigger bamboos, both in length and bore, to provide for a rich baritone sound hitherto unheard from a Bansuri. Also the design included introduction of a seventh tone-hole mainly to enhance overall tonal balance and facilitate meend at register-breaks. 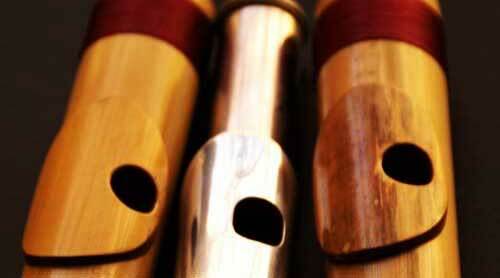 In the western musical world, however, there has been many major changes in flute design in the last 300 years. The most significant one being the one brought about by Theobald Boehm in 1847. He completely revamped the prevalent design of flute at that time. Boehm's design of flute has withstood the test of time and his design is still the one followed almost universally to make concert flutes even today. I like the deep, rich very stable sound of the Boehm flute a lot. At the same time I am not a huge fan of the key mechanism which makes only 'on/off' positions available for sounding a note (with the exception of French style open hole key flute). Though it is very convenient for the player it does not provide the organic connectivity of the notes - i.e. meend (glissando) between the notes is virtually impossible. 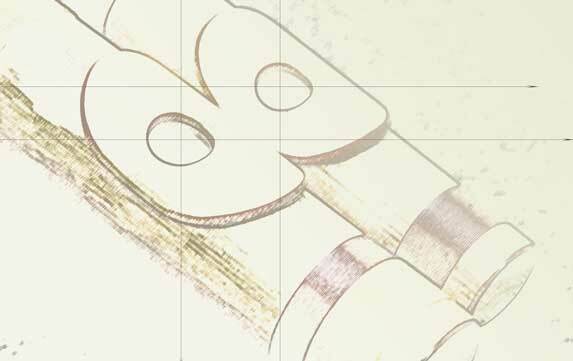 A Neo-Bansuri is not just a bansuri with a lip-plate slapped -- it is designed from scratch with specific selection of bamboo type and dimensions to complement the altered acoustic material introduced by the addition of lip-plate. Neo Bansuri (Sa=G) pictured here with a classical western C- foot flute. Point to note : 'Higher blowing resistance' -while provides added richness, stability and volume to the lower octave, can be a little daunting without some embouchure development, as the blowing needs to be more focused in the higher registers. You can add the Neo-Bansuri option to your bansuri (or Carnatic flute) in the paid customization section when ordering your flute.